Today’s update is brief but I might add to it this evening. More mid-90s Sega stuff to share today courtesy of the Vintage Computing and Gaming blog and the Angry Video Game Nerd. 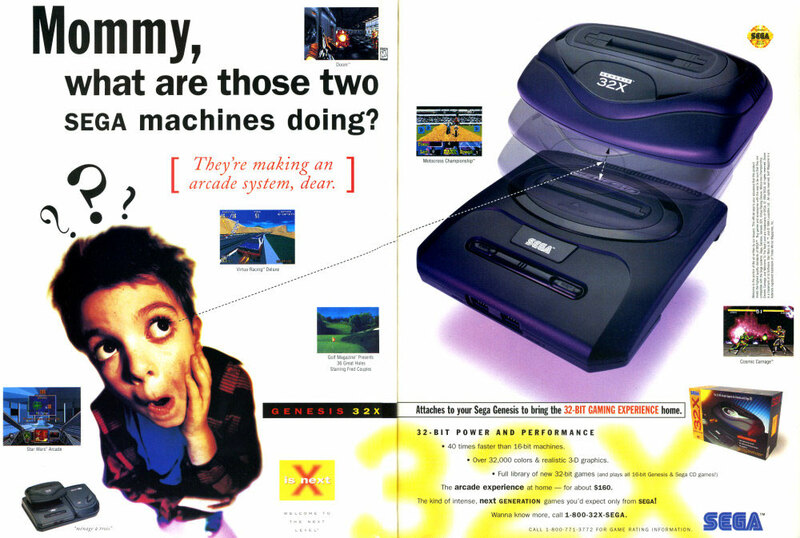 Despite this being an era of uncertainty in console selection, the 32X seemed like a great idea at the time. Compared to the newer, bigger systems on the horizon the 32X was a cheaper means of getting a little extra life from an aging system. On paper, anyway. If you had any trepidation about taking the plunge into the next generation of consoles then the 32X was there to help. On paper, anyway. Just like the Sega CD, I rented one of these systems rather than buying it. That was a great idea. Blockbuster provided the unit with absolutely no instructions and I had the same trouble with my system that the Angry Video Game Nerd had with his. I played “invisible” Star Wars Arcade for a half an hour before I found the required serial cable in the carry case. The following video is AVGN’s overview of the system and a few games. His frustrations are warranted. Editor’s note: YouTube is the ideal format for posting 32X and Sega CD videos because the compression does absolutely nothing to the quality. The games are really that grainy on TV. No joke. Check this evening for another update! Maybe!